Caputi is only 21 and has 23 goals for Wilkes-Barre this season, and Ponikarovsky is an unrestricted free agent at the end of the year, so it’s an unambiguous, old-fashioned deadline roll of the dice on Ray Shero’s part. Ponikarovsky is a 6’4″ winger with 19 goals and 22 assists this year in 61 games, scored 23 a year ago, and he’s somehow a +5 on the Maple Leafs despite their Conference-worst -46 goal differential (and he was a +6 last season). Maybe he’s some secret does-the-little things, physical, responsible dude? I can’t honestly say I really know much more about him other than him being one of the most talked-about names leading up to trade deadline next to Ray Whitney and Raffi Torres, and he’s clearly a better fit for the Pens than either of them. But for a full verdict, I’ll have to count how many F-words I yell when Crosby or Malkin set him up for one-timers before I can judge. I can’t imagine he’ll top Kunitz’s 35/Game. UPDATE (9:58 pm): The Pens are including Martin Skoula in the deal after failing to convince the NHL that they’d get under the cap by releasing a dude named Cappo McSalaryson. Stay tuned to Elvis Has Left, the only place on the internet for Trade Deadline updates. The Edmonton Oilers just traded defenseman Denis Grebeshkov to Nashville for a second-round pick as the first move in their impending trade deadline fire sale, because they have the worst record in the NHL, sit 25 points out of a playoff spot, and have been a giant disgrace of a franchise for about the last four months. Wooo!!! 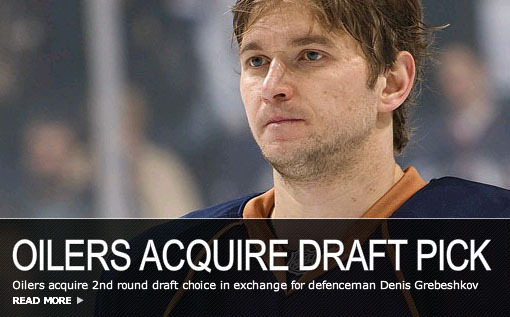 Hey Oiler fans, get ready for the stretch run, cause we finally GOT THAT DRAFT PICK! With the trade deadline looming Wednesday, the Oilers are still in the running to add some serious, impact cap space or a reliable, veteran expiring contract. In the meantime, you can pre-order your authentic “Second Round Pick” Oiler jerseys online now! Penguins Acquire Jordan Leopold From Panthers; Time For Letang To Hop On Orbitz? The Penguins have sent a second-round pick to the Florida Panthers for Jordan Leopold, a 29-year-old UFA-to-be stay-at-home defenseman. Any more hyphenated phrases I can use to describe him? He is also a jack-in-the-box. I like the move — the Pens get a veteran but not too old boring defenseman, which is exactly what they need, and even though he’s unrestricted this coming offseason, all they gave up was a second round pick, and second round picks basically only exist to be traded at the deadline for Jordan Leopold. The Milwaukee Brewers traded 27-year-old shortshop J.J. Hardy to the Twins this week for outfielder Carlos Gomez, but not before the Pirates apparently offered closer Matt Capps to the Brewers for Hardy and were turned down. Hardy hit 50 home runs in 2007 and 2008 combined, and despite a down 2009 (hit .229 / .302 / .357, 11 HR in 115 GP) would almost certainly represent an offensive and defensive upgrade over Ronny Cedeno. Hardy made just $4.6 million last season, too, so he’s an intriguing buy-low candidate coming off one mediocre season following two healthy, productive seasons. 2) Matt Capps was…something less than terrific for the Pirates this past season. The Pirates have traded 26-year-old reliever Jesse Chavez to the Tampa Bay Rays for 31-year-old Akinori Iwamura, a left-handed-hitting infielder who’s played second and third in parts of three seasons with the Rays but who appeared in only 69 games last season because of injury and the emergence of Ben Zobrist. Those Iwamura numbers include his age 29 and 30 seasons, so they’re not exactly comparable to Sanchez’s, but still — Iwamura’s production across his three-year career has been almost imperceptibly different from that of Sanchez’s healthy 2009, with a slightly higher OBP and very slightly less power (though the power gap might even narrow, as Iwamura is a lefty heading to PNC Park). Like most bloggers, I’m inherently skeptical to believe that teams like the Rays, Twins, Marlins, or A’s have lost a trade (it’s the opposite when the Royals, Giants, or Mets make a deal), but I’m in favor of the Pirates’ move here, and I feel like I’m in the majority among Pirate fans. Sorry for the lack of updates, I’ve been extremely busy this week — I was stuck in a meeting all afternoon and wasn’t even online to Control-V “What the hell are the Mariners doing? ?” to every single one of my friends online, including alternate screennames of dudes I’ve never talked to since I worked on a Spanish project with them in the second semester of my freshman year of college. In short, not having much regard for the thought of the 2010 Buccos running out two expensive thirtysomething middle infielders to begin with, I’m fine with the Snell/Wilson deal and particularly happy about the Sanchez trade. Now I will tell you why in the form of jokes!! Me: Did NH actually make a trade for just one guy? This dude must be the messiah. Dave: He thought he was getting a dude named Alder and his son. As for the Wilson deal, it’s a clear case where both players the Pirates gave up provide more value to the trade partner than they would’ve for the Bucs; Wilson is two months away from free agency, and the Pirates certainly weren’t gonna bring him back without a massive pay cut, though the Mariners might negotiate an extension or actually consider sucking up his $8 option to ensure this trade wasn’t a rental. Snell has an ERA around 5.40 over the past two seasons with a crappy 133/187 BB/K ratio in 244 innings. His numbers are likely to benefit from the park in Seattle and just the sheer probability of him not continuing to be this bad, but people will surely attribute this improvement to his clear-headedness following his change in scenery. Remember – he wasn’t feuding with Neal Huntington during the majority of those 133 walks (though Huntington did keep deflecting his balls out of the strike zone in his last major league start, which I thought was unacceptable). Huntington has repeatedly stressed the need for pitching depth throughout all levels of the minor leagues, which is really the only sound approach towards conquering the most unpredictable and oft-injured position in sports, and both transactions today are major steps towards achieving that nice-sounding mantra; if the Pirates tack on Colton Cain and Zack Von Rosenburg from their draft class this year, they will have essentially acquired 8/10 of their arguable Top 10 Pitching Prospects list in the past 12 months. Keep in mind – we aren’t even at July 31st yet! I can’t wait to see if Huntington has one final ridiculous-shakeup grand finale to this fireworks display of transactioning. McCutchen/Alvarez package deal? The Penguins today acquired veteran winger Bill Guerin from the Islanders for the exceedingly reasonable price of a conditional draft pick. It’s a 5th round pick if the Pens miss the playoffs, a 4th if the Pens make the playoffs, and a 3rd if an NHL/Versus anti-Devils coup somehow allows the Pens to win a round. Guerin has posted a pedestrian 16 G, 20 A in 61 GP this season, but you’ve gotta figure he probably didn’t see much power play time on an Islanders club loaded with snipers like Jon Sim and Andy Hilbert. He’s still a competent finisher, he’s a plus locker room guy, he won a Cup (albeit when Batman Forever was still in theaters), and he’s a right-handed shot (I thought the Pens retired “right-handed” to honor Lemieux?) He’s also a free agent at the end of the season, so his cap number will not hamper the team’s efforts to work out a long-term deal with Miro Satan. The only conceivable downside to this deal is that Ray Shero appears acually capable of drafting NHL players with picks later than 5th overall; if the Pens still had Craig Patrick GMing, trading a 3rd round pick would’ve meant not getting to draft some 11-year-old kid holding a souveneir stick who Greg Malone happened to spot while looking out his living room window with binoculars (aka, the Scouting Department).